This recipe was passed on to me by my maternal grandmother or Ajji as we affectionately call her, I thank her for passing this skill on to me as this has been a life saver for us after we moved out of home. She cooked many of these during her time and had developed a unique sense of balance for flavors namely the hot, salty & tangy – without tasting it until served she was able to achieve this balance in taste, every time!! A good spice blend or Sambar Masala Powder is the key to it turning out authentic. I will, in my future post, share a recipe for a good spice blend (Sambar Powder). They are also readily available at any South Asian store near you. Lastly – the tadka or tempering is like the icing on the cake! It just takes it to another level! 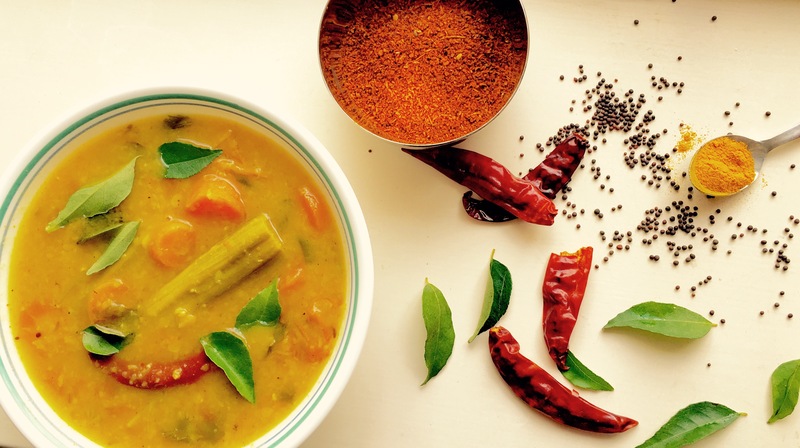 There are different variations of this recipe, every region of South India have their own unique recipe and hold it very close to their heart! This version is from Karnataka, India. Start by washing the Toor Dal in water 2-3 times or until the water runs clear. Then add drinking water to it and cook either in pressure cooker or in a cooking utensil for 15-20mins along with chopped tomatoes. While cooking add a pinch of turmeric and 2-3 drops of oil. Cook this on medium heat. In a second cooking utensil on medium- low heat, add oil, once hot add in asofoetida, cumin seeds, mustard, Urad Dal, dried red chilies & curry leaves (in this order, to avoid burning). While they splutter add in the chopped vegetables. Sprinkle some salt at this stage along and add the Sambar Masala Powder, mix well. Quickly add a dash of water to avoid burning and cook with lid on for 10 mins or until the vegetables are cooked through. Now, check if the Toor Dal is completely cooked through & disintegrating. If so, add the cooked Toor Dal to the cooking vegetables and stir well. Then add the remaining salt, taste it to check if its alright. Lastly, add the tamarind paste and chopped fresh coriander leaves and turn the heat off. Thank you for reading this post! I’m glad you enjoyed it, I appreciate it! 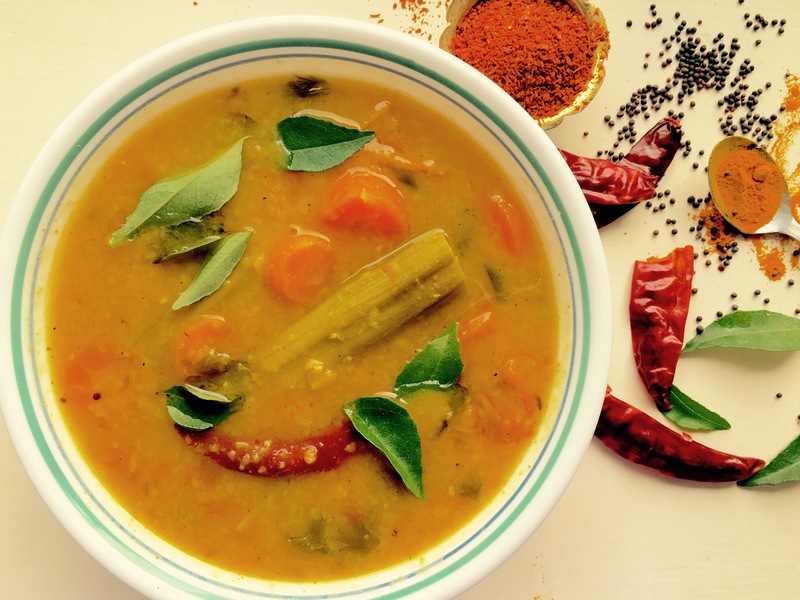 I love Sambar and going through the recipe just makes me want it right now. Great work.